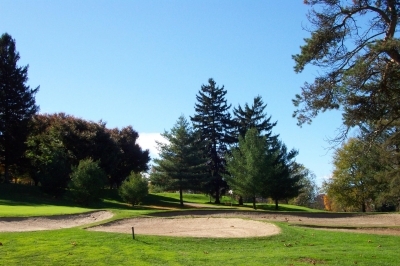 HERSHEY, PA � Lots of people own homes next to golf courses � there�s certainly no need to extol the popularity of golf course real estate in the 21st century. For some reason, even people who don�t play the game still want to live by it. But how many people love it so much that they�re willing to donate their houses to golf? Looking towards Hershey's High Point Mansion, from the West Course's 5th green. Milton Hershey did. Hershey�s 22-room High Point Mansion was completed in 1908, overlooking the chocolate factory (built in 1905) whose products made his name famous world-over. 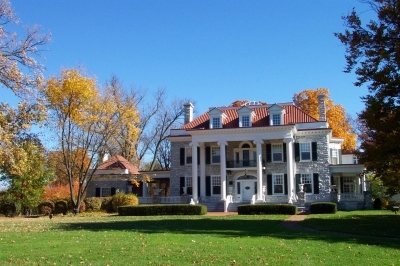 A few years after the house�s completion, Hershey embarked on a project to build a golf course, which eventually included a golf hole literally in his front yard. 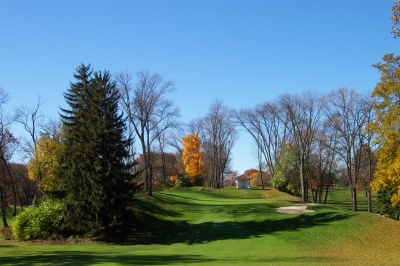 A complete 18-hole layout (designed by Maurice McCarthy) was finished in 1930, and the widowed Hershey decided to donate his home�s entire first floor to serve as the clubhouse for Hershey Country Club, keeping only a small apartment on the second floor for a personal residence until his death in 1945 (the carriage house off to the left of the front porch was the original golf pro shop). In other words, Hershey didn�t just want a home by a golf course. He had a golf course built for his yard. The 517-yard, par five 6th hole's tee is elevated -- but you've got to go back up another slope to reach the green. �He didn�t want to overshadow the National Open -- the premier event of the day -- but he also wanted to bring some prestige to his golf tournament,� Reed explained. 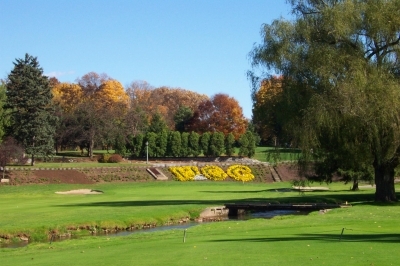 It can�t be said whether it was prestige or money that brought the best golfers of the day, but come they did, and Hershey Country Club�s golf course soon became a mainstay on what would now be considered the PGA Tour (they technically didn�t have a �Tour� back then). All of the greats came to play Milton Hershey�s golf course � Sam Snead, Byron Nelson, Harold �Jug� McSpaden, and obviously, Ben Hogan, who eventually was named the club�s Head Golf Professional (Hogan got the job based on a recommendation from Henry Picard, who served in that capacity prior to Hogan). Colorful landscaping behind the 6th hole's green lets you know exactly where you are -- but the smells of chocolate on the wind will do the same thing. 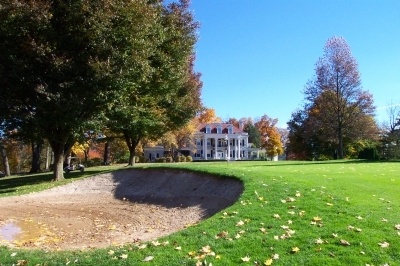 Hogan, like many of his colleagues, assumed the title of Hershey Golf Professional largely in a ceremonial role � though he and his wife would come to Hershey every spring and live in the Cocoa Inn until the time of the National Open, then hit the road to play out the tournament schedule (returning the following spring). Hogan served in that position until 1951, and his prevalent presence in that time period provides an added glimpse into the �star� quality that placed Hershey in the same category as places like The Homestead and The Greenbrier for top-billed golf in the Mid-Atlantic region. They also held a major championship on the Hershey West Course, the 1940 PGA Championship, where Byron Nelson defeated Sam Snead in the 36-hole final, three and two (the PGA winner was determined by match play competition back then). 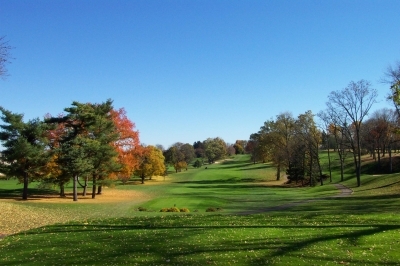 Even before the course was completed in 1930, Hershey had built a nine-hole course, and a few of those original holes (which date to as early as 1915) are still on the West�s layout � the current third, fourth and fifth holes, and the twelfth and thirteenth on the back nine. It looks narrow off the tee of the par five 13th hole, but it's really not. Like most holes on the West Course, there's plenty of room to drive the ball. 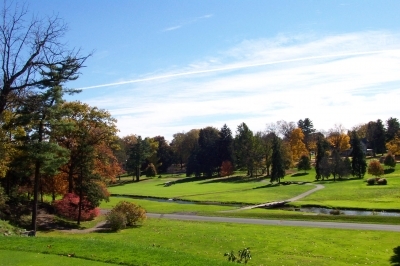 The West Course�s signature par three fifth hole plays over a ravine to a green right in front of High Point Mansion (for those curious, the mansion now houses the headquarters of the Hershey Trust). Certainly one of the more memorable shots you�ll ever hit, and one of the most unique. 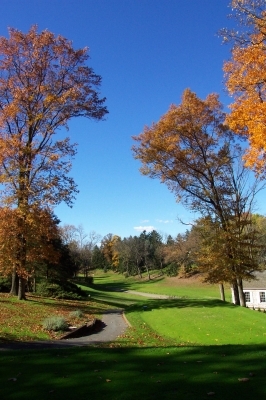 With your back to the Hershey factory, you�ll grasp the sense of history that is Hershey Golf Club. And if the wind�s right, you�ll get a whiff of the reason why golf�s here in the first place. 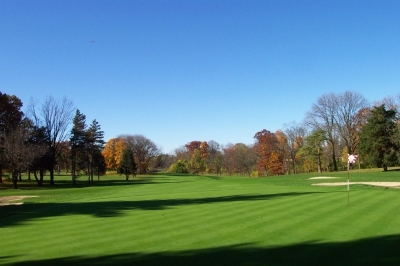 There is no doubting, the West Course is by far the best smelling golf course we�ve ever been on! The 1st hole is the West's #1 handicap hole. The well bunkered green helps demonstrate why it's so tough. �And the layout was essentially placed on top of old quarry land, so there�re lots of ups and downs and ins and outs � and a couple sharp dogleg holes. It�s a very interesting mix of golf and use of land taking advantage of the topography that was there,� Reed added. The course hasn�t changed dramatically in its 75+ years of existence, so those slopes that Reed was referring to haven�t really been altered by the hand of man � which is another aspect that you don�t see much of these days. For that reason, there are a couple rather quirky holes on the West Course, and you might get a bounce or two that�ll leave you scratching your head. A good example is the fourth hole, a 307-yard, slight dogleg left par four that tees off near a restored historic schoolhouse. The view from the tee strongly suggests lay-up, but a short-iron distance at that, since the landing area is pinched by trees. If you choose to go for it, there isn�t much margin for error around the green, either, as it�s a pretty small target. I guess they knew the risk-reward hole design concept four score years ago, as well. Set into a hillside, the green of the par five 15th hole presents one of the prettiest pictures on the course. Unlike its East Course sibling, the West allows for a run-up approach to most of the greens, which is a welcome extra shot option in everyone�s bag. The greens are relatively large and flat by today�s standards � to the point that if the West were to attract a higher-level tournament event, the putting surfaces would probably need to be re-built to provide for more challenge. The fairways and playing areas are exceedingly generous in most places, another throw-back to days of old when golf courses used a lot of land. The holes are lined with tall, mature trees which may play havoc with any shots whistled through them, but won�t deprive you of your golf ball if you�re a bit off-line. There�s also a noticeable difference in the number and severity of the bunkering on the West Course, especially off the tee. The East Course will require a bit more hesitation in club selection off the tee, but on the West Course, on many holes, let fly! That makes it a bit more fun, but it probably doesn�t rate as high in the strategic sense. The short par four 4th hole (307 yards) presents several risk-reward possibilities. Along with the fourth and fifth holes mentioned above, we particularly enjoyed the sixth hole, a 345-yard par four that steeply doglegs left. The tee shot�s over a creek to a generous landing area � again, with the factory at your back, wafting aromas of chocolate in the making. The second shot�s got a beautiful landscaped hillside as the backdrop � a very nice touch. The par three eighth hole plays a whopping 232-yards from the back tees � and the yardage book says it actually plays even longer. There�re bunkers near the green to complicate the problem � but most of the difficulty�s going to be getting there in the first place. 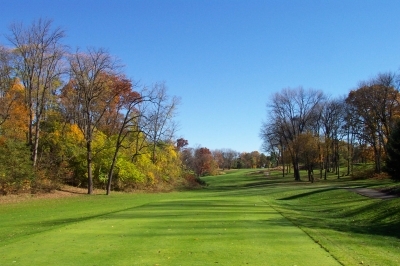 The back side offers a terrific stretch of holes from thirteen to fifteen, including two par fives. Here�s where you�ll really notice the rolling nature of the West Course�s topography, as there are ups, downs and sidehills to navigate. Playing conditions are superb at Hershey Golf Club. Here, looking back on the West's par five 13th hole. Thirteen is the number two handicap hole, and it�s relatively straightforward off the tee and on the second shot. Long and uphill much of the way (568-yards), it�s probably not reachable for anyone but the pros. There are clusters of bunkers nearer the green, which will certainly test your wedge capabilities on your third shot to try and steal a birdie from this hole. Fifteen�s (another par five) got probably the prettiest approach shot on the West Course, with the green set into a hillside surrounded by trees with a drop-off to the right side. The tee shot�s a bit downhill and the hole only measures 501-yards from the back tees � so here�s your chance to try that risky second shot into the beautiful green setting. 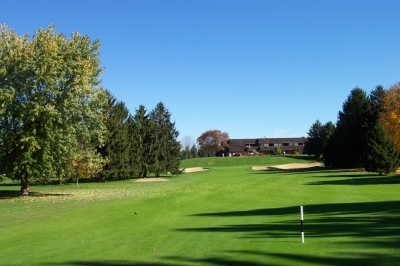 Like the closing hole on the East Course, the West�s eighteenth hole heads in with the clubhouse framing the second shot � a fitting conclusion to your journey through decades of Hershey golfing history. Take a long-iron from the tee of the par four 6th hole -- and that should be all you'll need to put you in good shape for the approach shot. Jim Reed says his club�s largest challenge is getting the word out that �Hershey� means more than just chocolate. Having been there, that�s certainly the case, though it�s not bad having a golf course next to a chocolate factory � or even in your front yard. Finishing up on the 18th -- you're shooting towards the clubhouse, and it's a nice view at that.